An action platform "defeat all enemies on screen" arcade game by Taito. 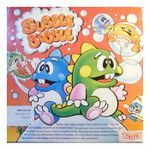 Players play the two small dinosaurs Bubblun and Bobblun (Bub and Bob), who can blow bubbles from their mouths. If the bubble hits an enemy, the enemy is trapped inside the bubble, and by jumping into the bubble, the bubble will burst and the enemy is defeated. By holding down the jump button and jumping onto a bubble (with or without an enemy in it), players can also use the bubbles to reach places on the screen that can't be reached in other ways. The game featured co-op play for two players. The popularity of Bubble Bobble was so big, the game was ported to an astonishing number of platforms. The game was spiritually sequelled by the game Rainbow Islands in 1987, and there was also a "Bubble Bobble 2" for the Famicon (NES), but the next arcade game, Bubble Symphony, didn't appear until 1994. Release date info from Wikipedia, "Bubble_bobble," available under the CC-BY-SA License.